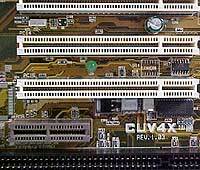 Naturally the CUV4X comes with one Socket 370, socket, as well as 3 DIMM sockets that support SDRAM modules ranging from 8MB all the way up to 512MB (maximum of 1.5GB.) SDRAM support is pretty extensive, PC-100, PC-133, and HSDRAM are supported. Future expansion is very important to many computer users, and the CUV4X does not disappoint. 1 AGP Pro slot (4X compliant) is provided (for highend video cards, basically power hungry ones,) 5 bus mastering PCI slots, as well as 1 ISA slot (for those pesky old modems,) and 1 AMR slot. Having the extra 2 USB ports may be a Godsend to some people, such as myself, because I have 3 USB devices with only 2 ports to plug them into. The onboard sound option is quite attractive for people wishing to build light multimedia workstations, or whatnot. There are 3 'Soundblaster' style connectors on the motherboard for CD-Audio, modems, and TV-tuners. There are two dual channel IDE ports on board that support ATA/66 transfers. Additionally there is the standard floppy drive port. The CUV4X also provides a some useless ports, we have the Wake-On-Lan header, and a Wake-On-Ring header. A closer inspection of the motherboard reveals the LED to indicate that the motherboard is receiving power, as well as a tiny cmos speaker. Fan enthusiasts will be happy to see that there are three, 3-pin fan headers. One of them is for the CPU, the other two are obviously for chassis fans. The motherboard has many well placed (smart design) capacitors on the motherboard to improve stability, and gives it the "professional" look that some motherboards lack.